If you like fast bingo, and fast cash, you need to get to Bingo Flash. This fabulous American bingo site really does know how to please its players and the range of promotions, giveaways, and cash prizes throughout the month of August really must be seen to be believed. The emphasis at Bingo Flash is on FUN. So are you ready to take part in a little game of musical chairs? This session takes place every hour and you need to bingo on the Chair Pattern for $25 guaranteed jackpots between 9 PM and 11 PM in the good ol’ USA Mixed Room. And unlike the kids’ game of Musical Chairs, where winner takes all, at Bingo Flash, there is something for everybody. If you win on this game, you will take home the guaranteed cash, but you will also leave behind some precious bonus points for roomies who didn’t win. At Bingo Flash, friendship is very important too. 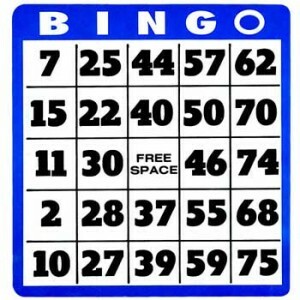 Find a roomie to pair up with before the start of the session and if you bingo, you will share four bonus points. Furthermore, the first three winners of the session will receive lashings of extra bonus points. And it’s time to show the roomies that you know. This fun guessing game takes place every Saturday and Sunday between 8 PM and 10 PM. The chat host will dish out one clue for every player and roomies to guess the correct names will win three bonus points each. As you can see, good times and fun bingo games are never far away at Bingo Flash. We can’t think of a finer place to play bingo online — get there now for your free bingo bonus and to let the good times commence.